Batter up! 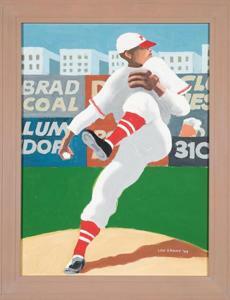 "The Art of Baseball" at The Concord Museum features a lineup of art works inspired by America’s pastime. Pictured are carved wooden player figurines from the early 20th century by an unknown artist. 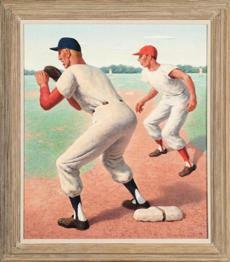 Curator David Wood said baseball still holds universal appeal. 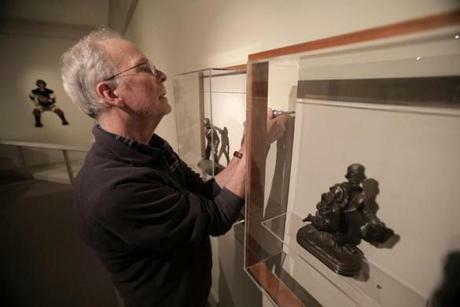 "It's a pop culture phenomenon you don't have to tinker with at all," he said. 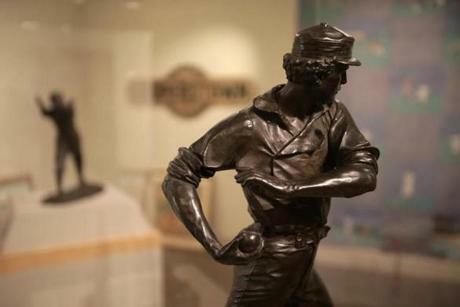 "The Baseball Player," a bronze statue by Douglas Tilden from 1888-1889. The exhibit will be at the museum until Sept. 20. 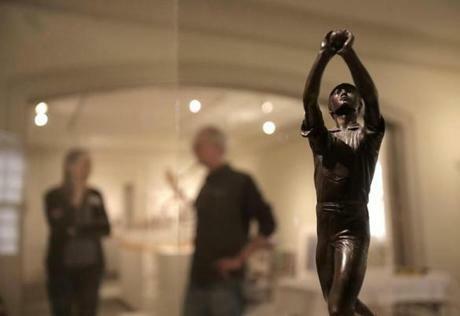 A sculpture titled "The Baseball Player" by Jonathan Scott Hartley from 1886 on display in the museum. 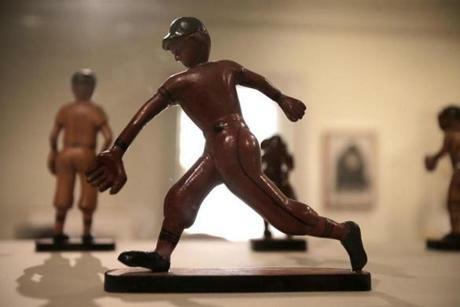 Most of the pieces come from the Gladstone Collection of Baseball Art, though visitors can also find some on loan from the National Baseball Hall of Fame. 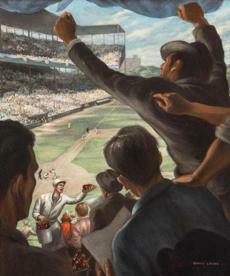 An oil on canvas painting by Edward Laning titled "Saturday Afternoon At Sportsman's Park." The display is the first time the Concord Museum has hosted one dedicated entirely to a sport. A linen pillow sham circa 1907 is part of "The Art of Baseball," exhibition. Three Red Sox championship rings are also available to view. 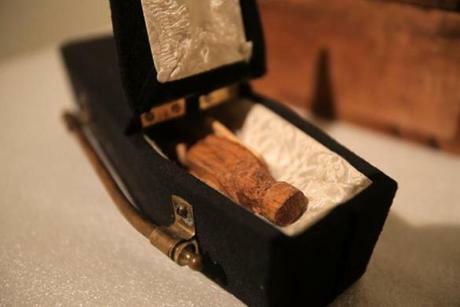 An elaborate piece of "trash talking," this carved wood player lying in a small coffin was sent from a team in Gorham, N.H., to another in Island Pond, Vt., before a game between the two. Visitors can also see the bat Red Sox Hall of Famer Jim Rice used to hit his 301st home run. 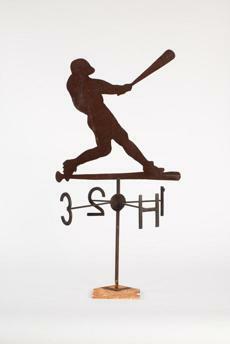 This weathervane is also featured in the exhibition. On display is an oil on canvas painting by Gerald Garston. This oil on canvas painting, titled "Man on First," was created by James Ormsbee Chapin in 1948. 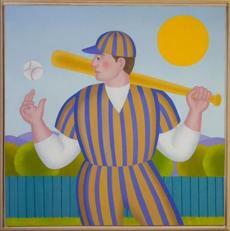 A painting by Lou Grant, titled "Reaching Back," is also in "The Art of Baseball" display. 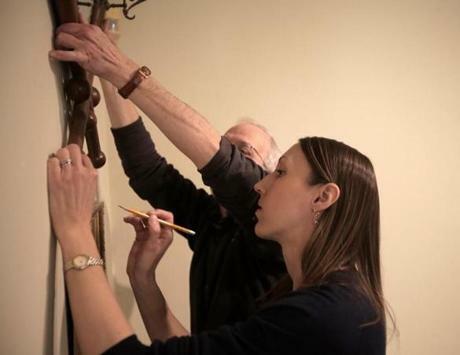 Collections Manager Adrienne Donohue hangs a piece of art at the Concord Museum. 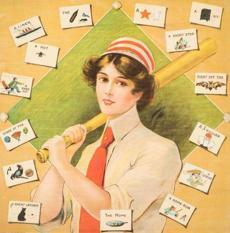 Organizers hope the baseball exhibit will draw a new audience.